LAHORE: Federal Minister for Information Pervaiz Rashid on Monday urged all religious parties of the country to meet Pope Francis and request him to play his role in stopping blasphemous caricatures from getting published in future. Speaking at a multi-party conference organised by Pakistan Ulema Council (PUC) here, he said those guilty of blasphemy against Prophet Mohammad (PBUH) were all ‘Satan’. 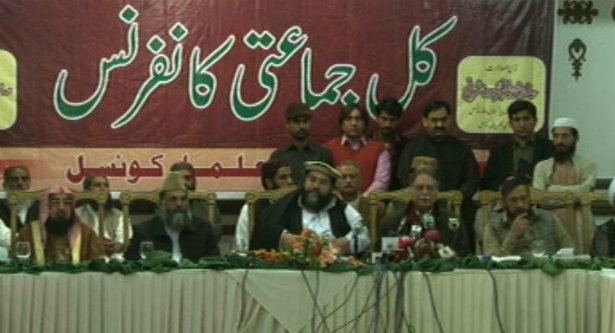 He said Muslims on the other hand cannot tolerate blasphemy against any messenger of God. “I appeal you to form a delegation and meet Vatican’s representative in Pakistan and the pope… and urge them to play their role in stopping ways of hurting people’s sentiments,” he said. A joint communiqué, issued after the conference, urged the Pakistan government to convene a meeting of Organisation of Islamic Cooperation (OIC) and contact the United Nations for legislations against blasphemy. The joint communiqué also demanded of the European Union to put a ban on newspapers and magazines for publishing blasphemous cartoons. The communiqué appreciated Pop Francis’s statement over blasphemy in which he condemned publication of blasphemous caricatures. The joint communiqué would also be presented to representatives of the UN and EU while letters would also be written to the world leaders in this regard. Meanwhile, a little disturbance was also witnessed during the speech of Information Minister Rashid when Pakistan Tehreek-e-Insaf (PTI) leader Fiazul Hassan Chohan interrupted the former. Chohan criticized Rashid for not truly representing Muslims on the issue of blasphemous caricatures. Upon this, the minister said the government was ready to extend any assistance on the matter. Chohan later left the arena, however, Ali Mohhamad Khan among other PTI leaders stayed till the conclusion of the conference.